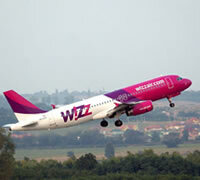 Wizz Air is a Polish/Hungarian low-cost airline focusing on the markets of Central Europe. Its main bases are Budapest Ferihegy International Airport (Hungary) , Katowice International Airport (Poland), Warsaw Frederic Chopin Airport (Poland), with hubs at Gdańsk Lech Wałęsa Airport (Poland), and Sofia Airport (Bulgaria). The airline was established in September 2003, funded by private individuals (Indigo Partners). It started operations on 19 May 2004, 19 days after Poland and Hungary entered the European Union and the single European aviation market. The airline carried 250,000 passengers in its first three and a half months, almost 1.4 million passengers in the first year of operations and to date, 5 million passengers.